My project 'Physical Bar Charts' is currently installed in the Durning Library, a busy public library in south London, part of the group exhibition Day to Day Data, which opened on 10 March. 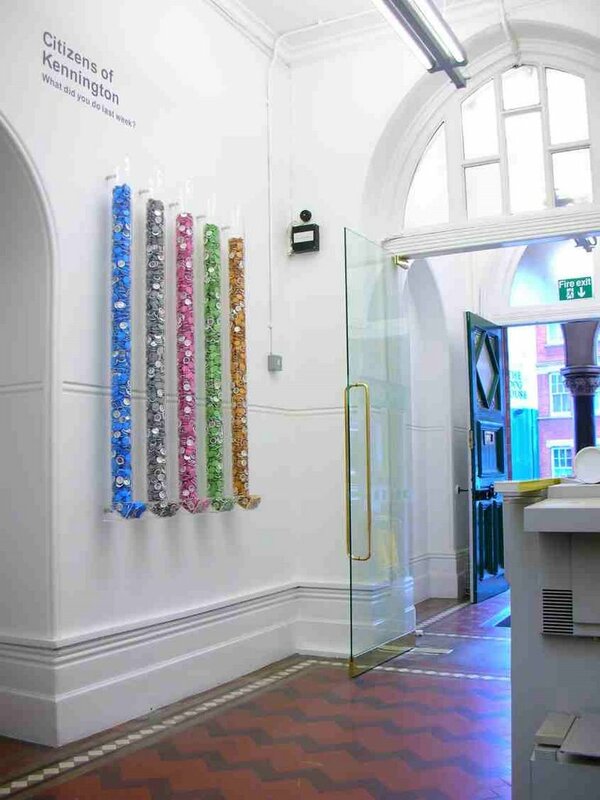 It consists of five acrylic tubes mounted on the wall, each with a dispenser at the bottom. Each tube is filled initially with around 1500 button badges, of one colour, with a single printed message on. 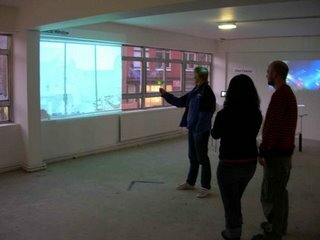 Over the course of the exhibition people can help themselves, the levels in the tubes drop and the reverse bar chart shows the varying levels of engagement of its passers-by. Here's a picture before the general public was allowed to help themselves. Blue "I made a stand"
Since late in 2005 I've been working with arts producer Greg Hilty to develop a strategy for a new public space within a new venue and cultural organization called Rich Mix, located on Bethnal Green Road in London's East End http://www.richmix.org.uk. The approach we have been taking is to use design to frame the questions, and, we hope, eventually get to the answers, as to what the particular space we are working on is for. The building, when it opens (in stages from April) will have three cinemas, a performance space, cafe, bar, a media lab, workspaces, a visual art gallery...and a space, currently called 'the News Room' which is currently undefined. Developing that definition is part of our brief, which is an amazing opportunity and significant challenge. Unlike the designers of the cinema or bar and so on, we have an additional challenge of invention. Our design-led approach has been enacted through a series of concept development workshops with a range of people, plus other typical design techniques such as sketching and modelling. 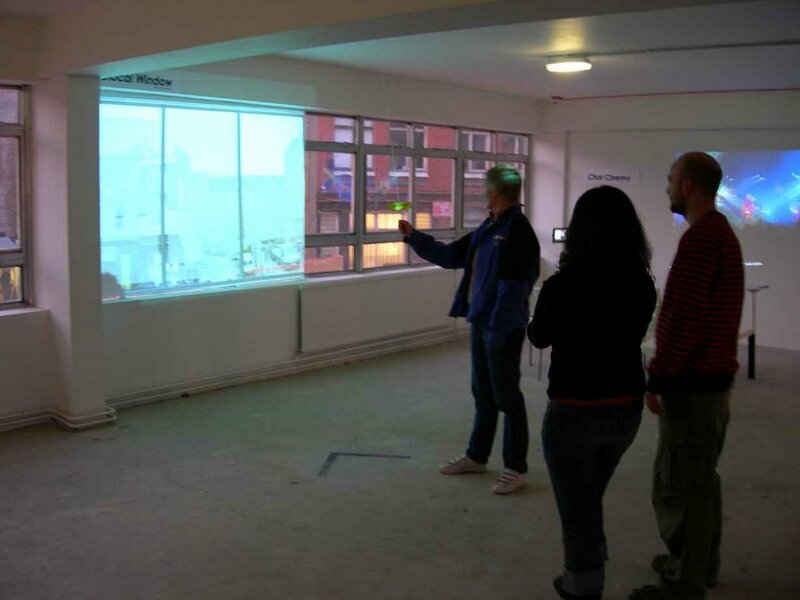 People involved in this development process include Rich Mix staff, invited designers and community activists, and George Grinsted (web developer) http://www.imgeorge.org and Radarstation http://www.radarstation.co.uk), interaction designers who created the experience prototypes we tested with an invited audience on February 24. With the agreement of Keith Khan (Rich Mix CEO) and Nick Kilby (COO), our next step is to further iterate the concepts we have developed for another round of experience prototyping. My current working definition for the Rich Mix News Room is that it is a 4-dimensional blog (2-d screens and opportunities for interaction, made present in a physical space, changing over time).